In October 2014, I launched my podcast Rhodes to Success and then in 2015, Corey Coates and I launched our show, The Podcast Producers. Since 2013, I’ve helped dozens of podcasters launch their show by bookings great guests for their show. With this experience in mind, here my top tips for launching a podcast. You have to know what your goal is for the podcast and be crystal clear about it. Where do you want your podcast to go? Is your goal to market your business or do you envision it becoming its own revenue-generating entity with sponsors and advertisers? You have to know what your goal is before you begin investing time and money into your effort or you will never get the results you want. Decide on a launch date. The biggest pitfall I see new podcasters fall victim to is a fear of commitment. They are afraid to commit to a launch date for their show. I firmly believe that you should set a launch date, carve it in stone, and stick to it! Without a launch date, you will get stuck in the mode of planning: plan and plan and plan without actually starting! That being said, be flexible. If something pushes it back a week, that’s OK. But don’t push off your launch by trying to be perfect. You won’t be good (at first). As soon as you explore the multitude of Facebook groups and online forums for podcasters, you will be quickly overwhelmed by all the marketing tactics and launch strategies that you’ll find there. There are countless marketers teaching new podcasters how to “game the iTunes system” to get to the top of New and Noteworthy. Friend, ignore them all… or at least most of them! You never win with an attempt to game the system. Successful podcasters are not those who are number one in New and Noteworthy. Successful podcasters are those who stick with it and keep publishing, consistently delivering valuable content to their listeners. Prioritize content over technical set up. You can also quickly get bogged down in the technical side of podcasting: how to record, getting a mixer, audio editing software, etc. as well as artwork and audio branding. It can range from a conference call recording to a $1,500+ studio set up. 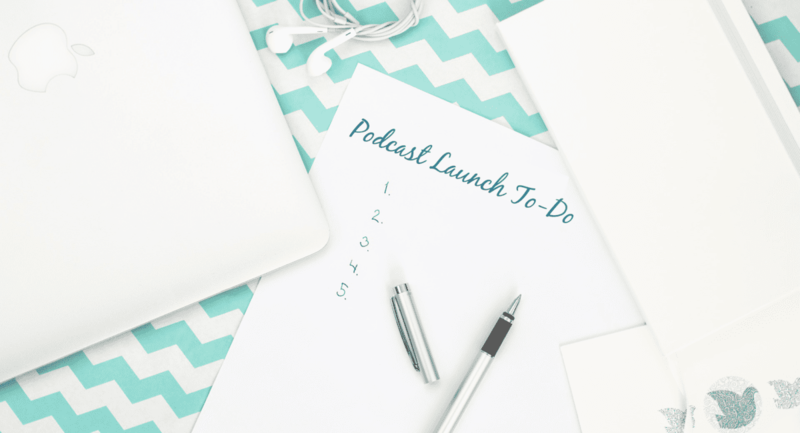 While I wanted my own podcast to be as professional as possible, I also knew that if I got too wrapped up in the complexities, I would not make my October 1st launch date. The old “analysis paralysis” in full swing! As with anything in business, it’s more important to implement and take massive action if you want to be successful. Getting stuck in pre-launch activities won’t help you. Yes, you need pre-launch planning but sticking to your date is more important. Your podcast isn’t doing anyone any good if it’s sitting on your computer without anyone to listen to it. You can and will improve as you go. Move at the speed of instruction. Do the best you can with what you have. Focusing a ton of your energy on launch and your iTunes ranking will burn you out. Podcasting is long term – a marathon, not a sprint. If you put most of your resources (your time and money) on the launch, you will quickly lose sight of the long-term vision for your show. The launch is only the start. The real game is ongoing shows that offer value to listeners. Work with my team at Interview Connections to book great guests on your show!